Today's dive ended with a whimper rather than a bang. 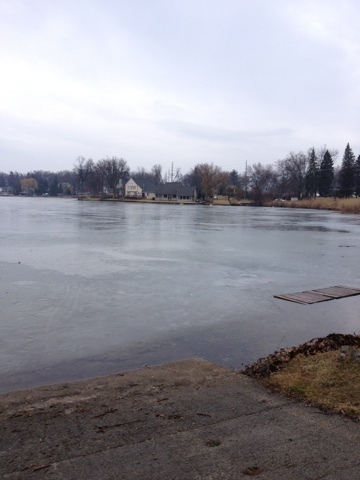 There was still plenty of ice on the lake but it was easy to enter from the shore to get under the ice. This morning I had assembled my gear and was waxing the zipper on the drysuit. That was when I found, right at the left shoulder, a hole in the zipper right by the teeth almost the size of my pinky fingernail. 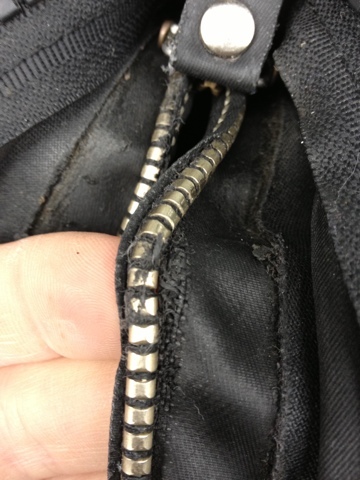 That explained the leak during the last dive - it wasn't the glove seal but a hole at the shoulder that did me in. So I came out anyways and we tried to seal the hole with gorilla tape. While gorilla tape does many impressive jobs, including taping and holding a watertight seal on neck seals, it does not, alas, work worth a darn on the zipper as I found out shortly into the dive. It did slow the water intrusion down a fair bit but I started feeling it creep in from the shoulder and strain to soak my torso. As there's still plenty of ice in the lake, that was enough for me to turn the dive and follow the line back to the surface. At least I wasn't totally soaked this time- just the shoulder down to the thighs and my socks were dry, as were both arms. To all my Christian readers, have a very Happy Easter. Much like a child having a tantrum, North Korea is busy screeching "Hey, Look at me, Look at me!" North Korea declared today it has entered "a state of war" with South Korea in the latest of a string of threats that have raised tensions on the Korean Peninsula. "Now that the revolutionary armed forces of the DPRK have entered into an actual military action, the inter-Korean relations have naturally entered the state of war," said the statement, which was carried by the official North Korean news agency and referred to the country by its official name, the Democratic People's Republic of Korea. According to a South Korean "expert" on North Korea, these threats are really just attempts for peaceful normalized relations with South Korea and the United States. "I don't think military action will be imminent," said Lim Eul-chul, a professor of North Korean studies at Kyungnam University in Seoul. Despite the bellicose statements, "Kim Jong Un wants to terminate the repeated harsh action and reaction [cycle] with the United States. They want to establish a more eternal peace mechanism and they want a more sustainable relationship with the USA." That's an interesting way of showing a desire for normalized relations. I daresay the expert should take a break from the academic delusions he seems to cherish. While the threats may be for domestic consumption to prove the current Nork leader's toughness, the threats are either an attempt at blackmail for more food or material aid, or the Norks are crazy enough to think they can win a short, victorious war - they'd be wrong on both counts, and hopefully the South Korean sand the US have the backbone not to be blackmailed yet again. Meanwhile, The White House takes these threats so seriously that President Obama is off, in between vacations, playing Golf. The NRA is currently offering a very nice deal to upgrade from regular to life membership. I figured that I certainly was gong to remain a member and the offer was for some serious savings over remaining a yearly member and just renewing every year. So, I went forth and pulled the trigger on the Life Membership, so I'm now an NRA Lifer in addition to being an NRA Instructor. And It cost less than 250 rounds of Russian steel-cased 9mm from Cheaper than Dirt. One begins to wonder how much of the ammo shortage is a real shortage, and how much is people picking stuff up to jack up in price and resell to fleece the suckers. For example: Winchester White Box 9mm 100 rounds (case of 5 boxes) at $269.99 or$53.99 per box? Or 1000 rounds of Remington 9mm Yellow value pack for $659.99? or get 1000 rounds of Blazer Brass 9mm for $679.99? But those are practically reasonable compared to the real winner of the gouging prize, Cheaper than Dirt. Not content to just jack up PMags, Cheaper Than Dirt (or are they named Lower than Dirt, its so hard to tell) outdoes them all. Cheaper Than Dirt is selling Tulammo 9mm steel case at $1.39 per round. Yes, you read that correctly. 1 farging box of 50 rounds of crap ammo for $69.59. A case of 1000 rounds would cost an insane $1,391.80! Cheaper Than Dirt sure as heck isn't. One should note that most ammo vendors, unlike the ones above, are not taking the opportunity to put their customers over a barrel. I'd advise thinking real hard about doing any business with these vendors now or in the future. Free markets are fine, charging all the market can bear is fine, sucking up all the ammo so you can rip people off is however pretty darn scummy and as such should have consequences. While they're free to rip people off, they do need to consider that people will remember how they acted in this time and choose not to buy from them now or in the future. Hopefully when this settles down they'll be stuck with lots of overpriced ammo that they'll have to offload at a loss. Sadly, its more than likely though they're paying standard wholesale rates for it and just jacking up the price and making a killing on the situation. Not one to be upstaged by Jesse Jackson, Al Sharpton is now showing up in Detroit, dipping in and promising civil disobedience over the appointment of the Emergency Financial manager. Note that both he and Jesse were noticeably absent as the city went down the toilet and both seem to have missed all opportunities to protest Kwame Kilpatrick's corruption and his treating the city like a personal piggy bank. Strange that. It's only when the state steps up to fix the mess the city officials have created that Al and Jesse show any interest. Hopefully no one will give this disgraceful clown any more airtime. Chelsea Clinton Said What?!? Really!?! Chelsea Clinton (now a special correspondent for NBC news - who said Democrats were against nepotism, again?) was doing a puff-piece on Detroit and education, as can be seen in the linked article. It was a puff-piece as puff-pieces go, but Here's the howler. [Detroit Public Schools Emergency Manager] Roberts and Covington, who operate some of the lowest performing and most-poverty stricken schools in the state, were interviewed by Clinton, a special correspondent for NBC News who ended her session by saying, "I don't have children but if I did I would be happy to send them to any of your schools." I'll wait a moment for you to pick yourself up off the floor or wipe off your screen after you've read that statement. I'm sorry, but the chance of Chelsea Clinton ever, ever, enrolling her kids in a Detroit Public School is between slim and none, with slim having left town. Never mind that doing so should be considered child abuse, but the sheer vacuousness of the statement is rather astonishing. She's clearly got a future in Democrat politics. We should also note that her parents rather than enrolling her in DC's public schools instead enrolled her in the tony and very private Sidwell Friends school. Public School is for thee, but not for Chelsea. In fact, should Chelsea Clinton actually have her kids actually enroll and attend the Detroit Public Schools for a full course of study, then I promise I will vote straight-ticket Democrat from that moment forth. I can say with absolute confidence that under such a wager I'm never going to be voting straight-ticket Democrat. So this weekend and on Monday we were in Toronto visiting family and celebrating Passover. We had a good time, and the kids got to have fun with their cousins. We arrived on Saturday and had a nice lunch with tash's mom and then met up with my Dad and that side of the family, including a nice dinner at their house. On Sunday the kids got to spend the day wioth natasha's mom while the two of us went out with Natasha's sister and her boyfriend. We saw the movie Quartet, which was more poignant than funny and a pretty good movie. It marked about the first adult movie Tash and I had seen in a theater together in about a year. We then went and picked up Tash's mom and the kids and went to Tash's sister's house for a belated 40th Birthday celebration for her. 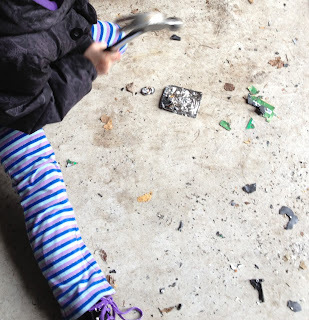 On Monday, prior to the Seder, not only did the kids get to go bowling but they got introduced to an important skill - permanent data deletion. My dad and step-mom each had an old laptop with data on them that needed to stay private. 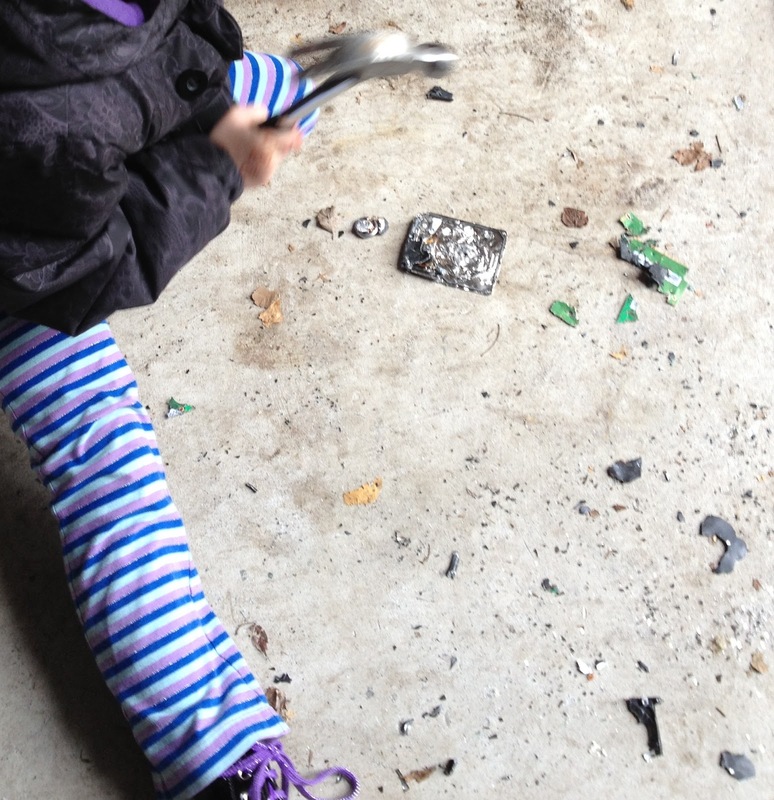 I yanked out the hard drives, and the kids then yanked the data off the drives. With a hammer and a pick. 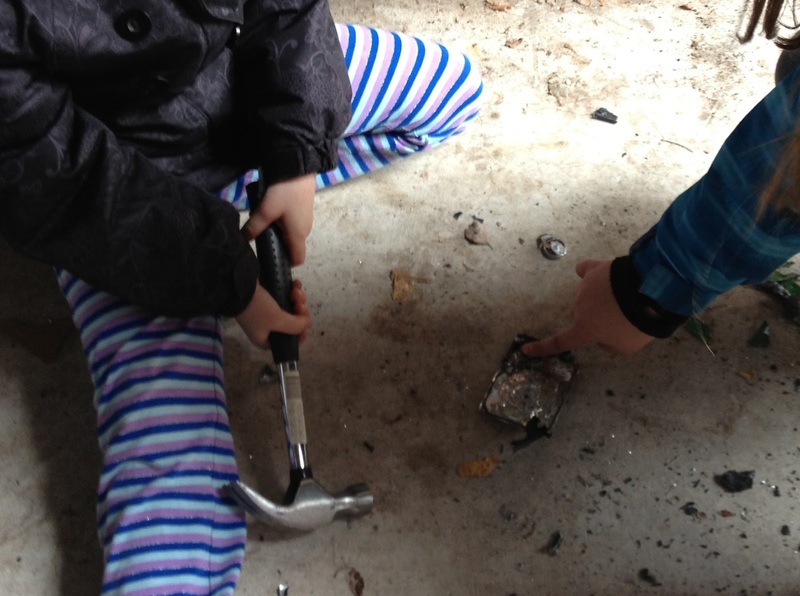 They joyfully set about smashing the hard drives to smithereens. 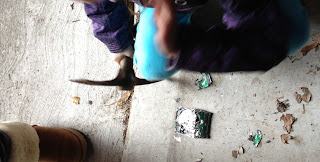 The hard drives having been reduced to fragments and the data thus destroyed, we changed and headed to the Seder. Abby did a great job doing the 4 questions in Hebrew and the Seder was a lot of fun. After the Seder we drove home as we both had to work today. Unfortunately on the way home we wound up getting pulled over for a secondary inspection at the border around midnight which was a pain. there were no other cars around so it was just our luck I suppose. Two sleeping kids, a cold night and an interminable delay. This was not good, especially as we had to wake the kids up, exit the car and wait in the inspection area as they looked through our car. Nothing contraband there of course, so it was a waste of everybody's time. The kids were then placed back in the car and the journey continued without any further events. Tonight the kids and I had a mini-Seder. Abby read the 4 Questions again in Hebrew and Leah decided to read the 4 questions in English. On all other nights we eat leavened or unleavened bead or matzah, while on this night we eat only unleavened bread matzah. On all other nights we eat all kinds of vegetables and herbs, but on this night we have to eat bitter herbs. On all other nights we don't dip our vegetables in salt water, but on this night we dip them twice. On all other nights we eat while sitting upright or reclining, but on this night we eat reclining. On all other nights we eat leaded or unleaded bead matzah, while on this night we eat only unleaded bread matzah. On all other nights we eat while sitting upright or recycling, but on this night we eat recycling. It was hard to keep a straight face. For the record, in this house all the bread, and all the food for that matter, is unleaded. We don't eat recycling either, really we don't. A very nice yet busy weekend. Detroit's decline and the appointment of an EFM is bringing all the usual race-card playing suspects out of their holes to assemble at the the hole that used to be the great city of Detroit. Not to be outdone by the local race-playin' pastors, the doyen of the race card, Jesse Jackson himself has come to town. “We marched too long and bled too much and died too young for the right to vote to have a governor, whether it’s Gov. Snyder or Wallace or whoever … to take away the impact of our vote,” he said. Wowza, the philanderer really just compared Gov Snyder to Governor Wallace. Really now? Detroit residents can still vote, but the idiots they vote for to run the City Council can't control the financial side of the city that they've destroyed, nor use the City's funds for their own aggrandizement and patronage slush monies. Too bad. Jackson warned an audience of about 100 people that the emergency financial manager’s arrival eventually could force Detroiters from their homes. He described a scenario in which rich people buy up acres of neighborhoods, turn them into vacant lots and sell off the property. Ah, the "they're gonna be stealing our jewels" scare tactic. Had Jesse even looked around Detroit he would have seen the multitude of already abandoned and decaying properties. His claim is pure scare mongering nonsense. "Detroit cannot be reduced to a rummage sale," Jackson said. Funny, Jackson's buddy Kwame already did that, and Kwame likely learned how to use civic foundation funds for personal use by Jackson's prior example. Jackson, who repeatedly used the phrase “emergency czar,” urged Detroiters to protest the emergency financial manager through “a major, mass nonviolent demonstration.” Jackson did not provide specifics of the protest when later asked. “It’ll be soon,” he said. Prepare for a clown show folks, bring popcorn. So on my way from my semi-regular meeting this morning I drove by Walmart as it was on the way back to the office and decided to see if any 9mm ammo was available. It was not. Nor was there much of anything else. Aside from 6 boxes of 22-250 (4 Winchester and two Remington) and two boxes of Remington Core-Lokt 30-06, the ammo display was completely empty. Supply is most certainly not keeping up with its best buddy Demand. I've been offline the past couple days while across the state to go to court. On Monday afternoon, I traveled up to Traverse City to prepare for a court appearance in the morning on Tuesday in Leelanau County to argue a motion for a client. That's a 4 hour drive away from home. It was a rather grey overcast day as I drove up, but we arrived there safely. After sleeping over at the hotel in Traverse City, I awoke to complete the trip to Sutton's Bay where the court is located, a good half hour farther north. Why is it every time I go up to Leelanau it has to snow the morning of the motion day? It's a shame I can't get to handle a motion up there in June. It kept snowing and then snowed harder as I approached Sutton's Bay, the location for the court. The half hour distance by map turned into a solid 50 minutes in the snow. Good thing I had planned accordingly and left early. It was snowing so bad that if it hadn't been for the stakes marking the road I wouldn't have been able to see it to turn on to it or stay on it through a few curves. The trip takes you along the bay with a nice picturesque view of the lake. It must be awesomely beautiful in good weather. I arrived at the courthouse, and of course it was still snowing and it continued to do so. On the upside, the Court tends to be a very friendly and collegial place up there, and the Judge is quite exceptionally good. The court staff are all friendly and not surly. First the court handled the criminal motion call which was pretty much all sentencing. One particular case was rather enlightening to watch. An 18-year old, slightly-built male had been transferred from jail to the courthouse and was being sentenced for a drunken home invasion. He also had a prior conviction for some drunken domestic violence with his girlfriend and has a 2 year old daughter at this point. Definitely winner material there. The attorney for the defendant pointed out an issue with the pre-sentencing report that while the defendant's Facebook account had references to him being a gang-banger and drug dealer, he was actually neither of those things and it was his friends hacking his acccount and putting those posts there. Yes, what you post on Facebook can indeed be held against you in a court of law folks. So the judge gives him a good long talking to, and advises him that while the county jail is a relatively nice place, state prison is not and that's where he'll be headed if the doesn't shape up fast. The judge looks him up and down and says, to paraphrase: "You may be trying to become an urban legend, but son, you just don't have the build to be an Alpha in prison, you're gonna spend most of your sentence as a toy for some big dude on a long sentence who works out all day in jail and you're not going to have a fun time of it." Yep, that just took the glamor of prison right out of the defendant and you could tell he hadn't quite figured it might go down that way. The judge notes that he needs to get back to school, quit hanging out with his current bunch of associates, and stop drinking alcohol as every single one of his crimes happens after he drinks. The judge then gives him time served and three years probation with lots of restrictions including obviously no possessing or drinking alcohol, no going to bars, and that he must either get a job or be in school, or preferably both so he can help support his kid. The judge did an A1 example of the whole "Put the fear of me rather than God in 'em in them 'cause while God might be busy and not follow up I sure will". With luck, the kid takes this chance and straightens his life out. In breaks between sentences I get a chance to converse with one of the attorneys there. He's an older gentleman and it turns out he's not only been a lawyer but has also been a probate judge and had a very varied legal life. A real decent and interesting guy, and we had a great if short conversation. The lawyers up there all tend to know each other and generally work together pretty well for an adversary system. In another break we chat with one of the prosecutors who note that most crimes up there are by basically ok people who are making bad choices. He then pauses and says, but that guy (mentioning another fellow up on sentencing who had his hearing was adjourned due to some pending charges by another County out of the same violation - think drugs and violence), that guy's bad and making evil choices. It's almost the afternoon when I get called at just about the end of the civil docket. The judge carefully goes over the motion, and my motion is granted and I'm all set. Then the four and a half hour drive home in the snow commences. But I'm back safe and sound and was even busy in Wayne County Probate Court this morning on some motions. Quite a different environment indeed from Leelanau County. While some things get better with age, its best not to be kept waiting for 60 years. An ex-soldier living in southwestern Michigan says the U.S. Postal Service has returned a letter he wrote to his wife from boot camp 60 years ago. A 60-year delivery time is nothing to sneeze at. He could have walked to deliver the letter and walked back to boot camp hundreds of times at that rate. Then-Pvt. Bob Rodgers says he'd just arrived for basic training at Fort Campbell, Ky., when the power went out, prompting him to write to his wife Jean. On March 7, New Carslisle, Ind., Postmaster Connie Tomaszewski hand-delivered the letter to the 79-year-old Rodgers. She tells the South Bend Tribune she did so the same day it arrived at her office. Postal authorities say they don't know what happened to the letter in between. Jean Rodgers died of cancer eight years ago. While the Post Office may even be 90% effective, that remaining 10% is a ton of lost mail. That the letter survived floating around the mail system for that long is rather impressive. Unsurprisingly, the Post Office doesn't release statistics regarding the amount of lost mail, and the 60 year arrival time for this letter just played hell with their delivery speed statistics. EFM Is Moving Quick to Try and Stabilize Detroit - But Will His Water Department Proposal Help Or Is It Playing The Suburbs For Suckers? After a bit of a rough start over some personal unpaid childcare provider unemployment taxes, the EFM, Kevyn Orr, is moving ahead to get Detroit on a more viable financial footing. As to the whole unpaid taxes thing, look he's rich and he's a Democrat that's standard for them. It's easy for him to overlook $16k in unpaid taxes related to some employees, after all he apparently had outside accountants to handle the whole thing, what did you expect? Newly minted emergency manager Kevyn Orr signaled Friday he is open to finding ways to generate cash from the city's assets like the water system, and may revisit plans to run Belle Isle as a state park. Orr said he might consider turning over management of the city's Water and Sewerage Department to a regional authority to leverage lease payments and shed billions of dollars in debt from the city's ledger. Detroit's $14.9 billion in long-term debts includes $6 billion in bonds for the Water Department that are backed by revenues from water and sewer users in 124 Metro Detroit communities. By becoming a separate authority with bonding authority, the water system could refinance its debt and use the savings to make lease payments to Detroit of $50 million or more annually, Johnson said. "That's a way to take $6 billion right off the books, which is a quick win for a new guy like Mr. Orr," said state Rep. Kurt Heise, R-Plymouth, who is sponsoring legislation to create a regional water authority different from the Detroit Water and Sewerage Department plan. City residents should be concerned about any plan that affects the city's control over the water department, said the Rev. Charles Williams of the local chapter of the National Action Network, the group that's leading protests against the emergency manager. "If the emergency manager had serious thoughts about selling the water, Detroiters should be alarmed," Williams said. "It is an asset, and it is a benefit, and it probably will create another hole in our budget that will ultimately lead to bankruptcy. "There is going to be a community outcry on emergency management itself. We're going to fight this all the way to the very end." What a maroon. It's an "asset" with over $6 Billion with-a-B dollars in debt. That's not an asset, that's called a huge liability. For Detroit, having the DWSD was great as it was a perfect location for corruption and feather-bedding, especially as it was mainly the suburban ratepayers who were stuck with the bills for the city's corrupt dealings that enriched the city's democrat powers that be. That may be very well why Williams considers it such an asset. On the upside to the deal if it goes through, the adults get to be in charge and get to put an end to the corruption and feather-bedding, and the suburbs get some control on the out-of-control rate increases that have been going up constantly to payoff Detroit politicos and connected cronies. The downside, of course is the regional authority and the suburbs get to inherit the mess, including the 6 billion in debt brought on by corruption and mismanagement, along with what will most likely be revealed as unperformed and deferred maintenance as money went to cronies and not construction. Why the authority (ie the suburbs) would not only want to assume 6 billion in debt but also pay $50 million annually in leasing payments for the water department to the same corrupt city that led it into 6 Billion in debt is rather questionable. Hell, Detroit should be paying the suburbs to take it off the city's hands. Are the suburbs about to be suckered? Stay tuned. Happy 4 Decades Day Tash! Not only is this St. Patrick's Day, which is a fine day all of itself, but it's an even grander day than that. Today the love of my life hits the milestone of her 40th Birthday! Love ya Tash, and you're just improving with age. The assassination of Julius Caesar and today, the Ides of March, was forever immortalized by the conspirators in his death by their striking of a coin, a silver denarius, to commemorate the deed. The cap of liberty flanked on each side by the daggers that did Julius Caesar in at the Forum. Of course, it didn't quite work out as the conspirators hoped. Instead of a return to thier cherished ideal of the better classes ruling with the Roman Senate supreme and no one man predominant, it instead led to a series of bloody civil wars that went on for 14 years, starting in 44 BC and culminating in 30 BC. The wars resulted in the rise of Octavian as First Citizen and Augustus - the first of the Roman Emperors ansd the end of the dominant power of the Roman Senate. Under existing law, people with concealed weapons permits may carry guns openly in schools and other gun-free zones in Michigan. But it's illegal to carry concealed weapons in those places. Democratic state Rep. Andy Schor of Lansing and Michigan's largest teachers union say the open-carry loophole for schools must be closed three months after the massacre at a Connecticut school. They plan to announce legislation Thursday. Look folks, a loophole is defined as a situation created by a legal ambiguity in a law. It is not a loophole when the act is specifically stated in the law that it is legal to perform that act. In this case it is absolutely not a loophole at all, but a quite specified legal activity under the law. (a) Imprisonment for not more than 93 days. (b) Community service for not more than 100 hours. (c) A fine of not more than $2,000.00. (c) An individual licensed by this state or another state to carry a concealed weapon. That's not a loophole, it's a clear statement that the activity is not a crime. It wasn't an area that was overlooked or ambiguous when the law was drafted. It is instead a very specifically stated permission for CPL holders to openly carry in Michigan Weapons-free school zones. Now, I understand that to a Democrat or the media, but I repeat myself, a loophole means people can legally do things that Democrats don't like. You would think they'd at least try and investigate what is being proposed and the current state of the law and whether there is any actual rational reasons to change the law before pontificating on it, but that's too much to ask for from our Democrat media. After all, they can't name a single instance of a death or injury caused by a permit holder openly carrying in a school zone. Indeed the Newton shooter, said to be the reasons for the need to close this "loophole" did not have a permit and thus wouldn't have been able to open carry in or near a Michigan school, and he committed numerous crimes on his way to commit mass murder. The crimes included massively violating Connecticut and Federal law on the weapons free school zone, which you will note didn't magically prevent him from carrying out his criminal acts. So what's the problem they're trying to solve by this ban, considering there is no problem in Michigan posed by permit holders openly carrying, as specifically permitted by law, in a school zone? My home internet service from Comcast was supposed to be fast, and I was certainly paying enough money every month for it. Lately however I've noticed its been quite slow, especially when watching shows from Amazon or if one of the kids is on Facetime or another app on another system at the same time. So I did a VUDU Speed Test and found I was getting all of 3Mbps. Considering I'm paying for 20 Mbps this is disappointing to say the least. It turns out the modem I had issued to me from Comcast was the problem, being only a DOCIS Level 2 modem. While their tech support claimed it was not the problem. Well, it most certainly was. This led me to my latest home project. I went online to Amazon and bought a Linksys DOCSIS 3.0 Cable Modem (DPC3008-CC) from Amazon for all of $78. I installed it and had Comcast register it for service and hey whaddya know, I'm now getting 20Mbps and its great. So yes, I was right and the online tech was wrong, imagine that. The tech I spoke to today setting up the system was far more competent. Considering it's $7 a month to lease the super-slow-modem from Comcast, I'm ahead in money in less than a year with much faster performance to boot. The difference between 3Mbps and 20Mbps is very real. On top of that, I went and bought an OBi100 VoIP Telephone Adapter and Voice Service Bridge and have now replaced the Comcast Home Internet Telephone system with The Obi and Google Voice for essentially a free home phone and a payoff measured in less than 2 months. More money saved and more fun in configuring the service which actually is not that difficult to do. The quality is just fine and I can't beat the price. If you've got Comcast Internet, I'd strongly advise running a speed test a few times to see if you're really getting the performance that you're paying for from them. I'd also suggest looking at Obitalk's OBi100 and Google Voice for home VOIP telephony service. Kevyn Orr, an experience restructuring attorney has been appointed to be the Emergency Financial Manager for Detroit. As is necessary under the reality of Detroit's racial identity politics, he's black. Thankfully for Detroit, he's got something more important than his skin color to qualify him for the job -- he's a very competent and capable man and may just be what Detroit needs to pull it out of it death spiral. They effectively managed to demonstrate they were idiots but didn't accomplish much else. Deliberately messing with traffic in rush hour should be a hanging offense, or at least a Tasing lasting as many minutes as the miles under the speed limit they were driving. [Michigan State Police Lieutenant] Shaw said that last week 10 people were cited for driving under the minimum speed limit, two people were arrested for driving with suspended licenses, three people were busted for having outstanding misdemeanor warrants and a gun was taken away from one protestor whose concealed pistol license had expired. Like I said, Detroit idiots. "I didn't want to leave my country but that was the way we were forced to live there," said Pacheco, who stood outside the U.S. Immigration and Customs facility on East Jefferson with about 50 others. His story, told in Spanish, was followed by a simple, spirited chant by immigrant rights advocates: "Undocumented and unafraid, undocumented and unafraid!" Right outside the Immigration and Customs facility, openly admitting to being an illegal immigrant and showing contempt for the law. In more law-abiding times, ICE could step outside their office for an easy collar. Now, not so much. It's impressive how this administration picks and chooses what laws to enforce and what laws to ignore. Denial, as we've noted before, is not just a river in Africa. Meanwhile in Detroit the rivers of denial and corruption both run deep. Of course his family will continue to claim he's innocent in the face of a mountain of evidence to the contrary, if anything to cover the benefits they've received and their roles in the scandal. Ayanna Kilpatrick Ferguson herself has appeared in text messages that have come under legal scrutiny in regard to the former mayor, one of which she complained to her brother about Bobby Ferguson blocking others from getting contracts. "Here we go with this Bobby bull again," Ayanna Kilpatrick Ferguson wrote in a 2004 text message to former mayoral aide Derrick Miller. "Can we make a $ too?" Ayanna Kilpatrick was also member of the New Vision Foundation, a charity founded by the Kilpatrick family to help Detroit students. In 2004, it was discovered that nearly $400,000 of the $717,000 the foundation had raised in the two previous years was paid in salary to Ayanna Kilpatrick, Carlita Kilpatrick (Kwame Kilpatrick's wife), and to attorney, and family friend, Lisa Cylar Miller. When over 50% of the "donations" to a charitable foundation are going to friends and family of the Kwamster as "salaries", you can tell this foundation was designed more to further feather the nest and wash money rather than truly act as a charity as most people understand the meaning of the word. I suspect we still haven't seen the bottom of the sewer of corruption that has been Detroit under decades of one-party Democrat rule. Dutch Terrorism Threat Level Raised to "Not Gouda"
The Dutch government raised its terror threat level Wednesday from "limited" to "substantial," saying Dutch citizens are traveling to Syria to fight in the civil war and could return battle-hardened, traumatized and further radicalized. "The chance of an attack in the Netherlands or against Dutch interests abroad has risen," the country's National Coordinator for Security and Counterterrorism said in a statement. Who could ever have predicted this? Who knew that radical Muslims when faced with an open multicultural society and granted European citizenship would then instead of adopting European enlightenment ideals turn and pose a threat to that society? In other words, let's have the state let us keep doing what we're doing that got us into this mess, only harder. Detroit city officials this morning asked the state to agree to an updated, aggressive restructuring plan rather than appoint an emergency financial manager. The plea was part of an appeal of Gov. Rick Snyder’s declaration that Detroit needs an emergency financial manager. Detroit officials want a modified version of the consent agreement they reached with the state in April. The agreement laid a framework to fix the city’s financial mess. Of course to Detroit "A deal's a deal" doesn't mean what you think it means. Instead in Detroit it seems to mean that the City can breach its part of the agreement, but the state must uphold its end of the deal no matter what the city does. But the state does not seem inclined to agree to another consent agreement. Frederick Headen, a lawyer representing the state at this morning’s hearing, recalled the city’s legal challenge to the April consent agreement. “We took issue with the unwillingness of city officials to abide by its terms,” Headen said at the hearing. Bring popcorn, for as noted in the article, the City Council's and the usual suspects and interest groups' antics aren't over yet. Republicans Castigated For Not Agreeing To Make Something Already Illegal Even Illegaler! Sometimes you can't make this up. The Detroit Free Press, whether out of sheer ignorance or partisanship (or indeed both, this is the Freep after all), is castigating Republicans for not glomming on to a Senate gun control bill that would make straw purchases illegal. The problem is, straw purchases already are illegal. [I]n connection with the acquisition or attempted acquisition of any firearm or ammunition from a licensed importer, licensed manufacturer, licensed dealer, or licensed collector, knowingly to make any false or fictitious oral or written statement or to furnish or exhibit any false, fictitious, or misrepresented identification, intended or likely to deceive such importer, manufacturer, dealer, or collector with respect to any fact material to the lawfulness of the sale or other disposition of such firearm or ammunition. [K]nowingly makes any false statement or representation with respect to the information required by [federal firearms law] to be kept in the records of a person licensed under [federal firearms law] or in applying for any license or exemption or relief from disability under the provisions of [federal firearms law]. Punishment for such straw purchases are include a fine of up to $250,000 and up to 10 years in prison, and its not new law. The Freep editorial helpfully (not) fails to tell us the name of the bill Republicans were against, so i had to check the Senate Judiciary Committes' calendar for March 7 and its most likely S.54, the "S. 54: Stop Illegal Trafficking in Firearms Act of 2013"
The bill increases the potential punishment from 10 years to 20 and with up to 30 years if the transferee knew or had reasonable cause to know it would be used in a crime. Considering, that in the words of Vice President Biden, "regarding the lack of prosecutions on lying on Form 4473s, we simply don't have the time or manpower to prosecute everybody who lies on a form, that checks a wrong box, that answers a question inaccurately." So, what will an additional 10-20 potential years do to deter such acts when the VP already admits the feds aren't enforcing the law already on the books with its 10 year penalty now? The bill also does some changes including forfeiture and making such a violation a possible RICO or money-laundering offense and some other definitional changes that are hard to follow in the brief time I've had to review the bill. In short, its a stupid, Democrat feel-good bill because the Democrat executive has already stated they have no intention of enforcing it. If they refuse to enforce the existing law with a 10 year penalty what good would the same law with an enhanced 20-30 year penalty do? Funny how the Detroit Free Press fails to report that and instead claims Republicans are in the arms of greedy arms manufacturers for refusing to go along with this charade. Courageously risking the loss of a politically active and regularly-voting population in this state, Republican State Rep Tim Kelly is taking quite a chance in proposing legislation to prevent the issuance of Bridge cards (the modern food-stamp replacement) to deceased Michiganders. The bill proposes to require what Human Services should already be doing: checking the death rolls monthly for anyone that may have died. If you're dead, no bridge card for you. Whether this is the final straw that drives the dead to seek out human brains for sustenance is yet to be seen. One thing is certain: This Republican sponsored bill certainly won't end, and if anything reinforces, the dead and undead's trend of voting straight-ticket Democrat. The Detroit City Council quixotically persists in its appeal of the appointment of an EFM, trying to hold onto their positions as the city crumbles under their chronic mismanagement. As they do so, they're going through the classic Kübler-Ross model of dealing with grief and impending demise. "We're not appealing the fact that we have a financial emergency. We know that we do," council President Charles Pugh said last week. "We're not naïve, and we're not out of our minds. But what we are saying is that an emergency manager is not the way to fix it." It's nice that at least some of the Council is finally over Stage 1 - Denial. She's called the consent agreement an "unprecedented right-wing gangster move." She accused the state of wanting to turn Belle Isle into a "playground for the rich." And the prospect of an emergency manager? "Constitutional assault." Watson — daughter of a Methodist minister, eldest of 10 children, lifelong civil rights activist — has become the public voice of Detroiters determined to hang on to self-rule as the city faces a prospect of a state takeover this week. But for Watson, there's no way the birthplace of the labor movement, the Nation of Islam, the Shrine of the Black Madonna and Motown will be taken over by the state on her watch. "Someone said to me this week, they cannot believe that Detroit of all cities would be subject to this in-your-face constitutional assault," Watson said during a recent rally. "We must hold true and recognize none of our freedoms were acted easily or comfortably. Nobody is going to come in and perpetuate a right-wing agenda." Note this is the same angry Jo Ann Watson that cared so much about the City of Detroit that she paid only $68 per year in property taxes for over a decade for her quite large Tudor house as it somehow listed as an empty lot. A few idiots followed her lead and purposefully blocked traffic on I-75. That's because their claim to have right to vote for a city council (they still will, its just that the council won't be running the show anymore but an EFM after the council's often and consistently demonstrated incompetence) to destroy the city gives them permission to block traffic. I'm sure we'll see the City Council hit Stage 3 shortly, with some last minute bargaining for a new consent agreement or other deal that leaves them in charge in return for perhaps more oversight or accountability. Good luck with that one considering how they tried to play Snyder and the state with the last consent agreement. Kilpatrick was found guilty of 24 of 30 counts, including racketeering, but the jury apparently couldn't reach a verdict on some of the remaining charges including some bribery charges. Bernard Kilpatrick was found guilty of only one of the four charges against him, filing a false tax return only and not the racketeering charge. Should be interesting to get the rationale behind that decision. Joel Ferguson was convicted on nine of eleven counts: racketeering, extortion, and filing false tax returns. That brings the most overtly corrupt mayoral administration in Detroit to an end. Note: revised once reporters count their count charges straight. Apparently the Jury has finally reached a verdict and will announce it shortly. Should be interesting to see what they'll do, as some jurors have requested to speak to the media after the verdict is announced. More than 30 heads of government, including Cuban President Raul Castro and Iranian leader Mahmoud Ahmadinejad, were scheduled to attend. U.S. Rep. Gregory Meeks, a New York Democrat, and former Rep. William Delahunt, a Democrat from Massachusetts, represented the United States, which Chavez often portrayed as a great global evil even as he sent the country billions of dollars in oil each year. In other news, Hugo Chavez is still dead, killed by socialist healthcare. At my local Walmart, they did have a little bit. Apparently a ship had just come in and they sold out of a case of Winchester White Box 9mm 100 round packs in less than an hour - and that's with a three box maximum per customer purchase policy. Luckily for me, there were 6 boxes of 50 rounds each of Federal 9mm remaining and I purchased my maximum of three boxes. That's enough for all of 1 USPSA match, assuming I have no misses (Good luck with that). There was no .40 nor .22 and only a few boxes of .17HMR, and 3 boxes of .45 Auto remaining, looking all lonely on the very bare shelves, which I didn't buy as I reload for 45 so I might as well let someone else get it who needs it more. In speaking with the clerk that opened the locked display where the ammo was sitting, she confirmed they do indeed get, and will continue to get ammunition deliveries. She stated it is highly unpredictable as to when they get it and how much they get in each shipment, but they do get it, typically on a weekly basis. In short, there's no over-arching Walmart conspiracy to stop stocking ammo - they just can't keep it in stock as people are buying it and buying it both early and often. Supply and Demand isn't a suggestion, but I'd suggest they'd start increasing the supply if practicable as they're leaving money on the table with this shortage. Yes, I know ammunition manufacturers are at capacity now and it takes time to get new production lines up and running, but this demand increase wasn't exactly unexpected. In addition, the legions of new gun owners likely aren't going to just put up their new firearms into storage and never use them, so the demand for ammunition will likely remain strong (but not this crazy) in the foreseeable future as these new owners get out and practice and have fun with their new firearms in training, competition, structured practice, or simple plinking, hopefully on a regular basis. So Mayor Bing realizes some windmills aren't worth tilting at, and some appeals won't save you from the mess you're in. The Detroit Clowncil, not so much. [City Councilman] Brown's colleague James Tate said it's unfortunate that Bing's position fuels the perception that the council and mayor cannot work together. Bing's lack of support for the appeal "means nothing," Tate said. "We are just going to move forward." That's a full on Forward!, right over the cliff of despair, debt, and doom. And indeed, the Detroit ministers decided to mix a little religion into the politics of this anti-EFM show. "We pray there will be divine intervention. What council can't stop, legislation won't stop and the court won't stop, almighty God can stop," said the Rev. Robert Smith of New Bethel Baptist Church. "There are so many things we are not in charge of. We ought to at least be in charge of self-determination. Forget about even parsing the logic of that statement. We'll simply say the sorry saga of Detroit's Democrat rule and its City Council's self-determination (and self-enrichment) has brought the city to the edge of bankruptcy and actual ruin. Apparently the good reverend's solution is to keep in charge the same idiots with their policies and mismanagement that brought it to destruction so they can keep doing it, but harder. Yeah, that'll work. The Rev. Charles Williams II during his sermon Sunday likened the appointment of an Emergency Financial Manager to the arrest and crucifixion of Jesus Christ. Williams read from the Book of Matthew: "'The chief priests and the elders assembled in the palace of the high priest and they schemed to arrest Jesus and kill him.'" He then added: "The chief priest — Governor Snyder," which elicited a chuckle from about 30 worshipers at Historic King Solomon Church on the city's west side. After all, no one acts nearly as Jesus-like as a bunch of corrupt city councilors, along with a corrupt cabal of unions and Democrat apparatchiks who for decades have been neglecting and robbing the city blind for their own ends. "What Jesus went through reminds me of the current situation in Detroit," Williams said. "He told people 'you don't have to allow the Pharisees to abuse you.' And because of that, they killed him. Those who conspire today to get rid of democracy in Detroit are the same people who conspired to get rid of Jesus." Credit must be given to Snyder for the foresight to announce an EFM at this time - it's still too cold for the ministers to whip up a decent riot right now. After forecasting doom, eminent destruction, dogs and cats living together, the Obama Administration is starting to backpeddle a bit on their prognostications of peril. The White House is retreated from its doomsday predictions about the impact of the $85 billion in federal spending cuts as they enter a second week -- with Republican leaders appearing at least satisfied about delivering on their promise to limit government spending and hold down taxes. Gene Sperling, the White House's top economic adviser, repeatedly said Sunday the cuts will not hurt as much on “Day One” as they will over the long haul. His remarks are in contrast to weeks of President Obama and his Cabinet warning that the cuts will result in furloughs or pay cuts for middle-class wage-earners such as teachers, Capitol Hill janitors and air traffic controllers, which they said could cause 90-minutes delays at major U.S. airports. Apparently not so much, and as usual, the Obama White House has some issues with the truth. President Obama and top administration officials are struggling with accuracy in explaining the impact of billions in federal budget cuts known as sequester that kicked in Saturday morning -- even getting called out by a Capitol Hill superintendent about furloughs for support staffers. Substituting doomsday rhetoric over accuracy has been the stock-in-trade of this administration. After continually trying to work with the City of Detroit's local government and getting played in return, Gov Snyder has finally stepped up and stated he will appojnt an Emergency Financial manage for the broke and broken city. Gov. Rick Snyder said Friday he is prepared to sideline Detroit's elected officials and bring in an emergency manager to handle the city's affairs in an unprecedented effort to stave off financial collapse. The move, which the city has 10 days to appeal, would make Detroit the largest American city ever to operate under state control and could effectively leave the mayor and nine City Council members out of a job. Snyder said Friday he concurs with a review team report released last week that concluded Detroit is in a state of financial emergency. He praised city leaders for working to fix problems, but said it's clear the consent agreement forged in April hasn't worked swiftly enough. "It's time to say we should stop going downhill," the governor said during an invitation-only town hall meeting Friday with media and community stakeholders. It's long past time for the city to stop going downhill, but after giving them every chance and then even more chances beyond that, it looks like Snyder has had enough. Expect the need for plenty of popcorn over the next ten days as the City leadership keeps on fiddling as the city colapses and as they make whatever factually and legally baseless challenge to the appointment of an EFM that they can to stay in power at any cost. Verily, to the liberals the very image of the gun is full of terrible power, leading to evil by anyone even daring to make the merest abstract depiction of one. What the hell? 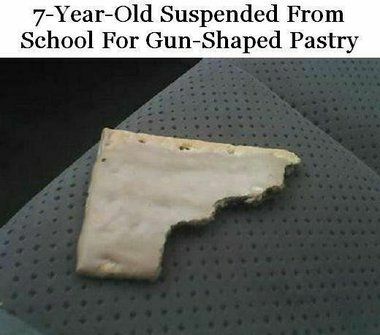 A two day suspension is somehow warranted for nibbling on a Pop-Tart until it appeared to form a semi-gun-like shape. Quelle Horreur. Even worse, all Pop-Tarts have a filling of some sort, so to the teacher's and principal's minds (such as they were), it was loaded.